Todays kids are among the first to view eco-friendly living as normal and not some fringe movement. They attend schools with recycling bins for paper and plastic, and theyve heard the phrase climate change at least once. Some might even say were seeing the effects of it. Al Gore has even come out and blamed the disaster of Hurricane Sandy on global warming, as if it wouldnt have happened without humans occupying the planet. But kids are still kids, and they still want to do things that are fun and interesting and maybe let them get a little dirty. Luckily, environmental living doesnt have to be boring. Check out sites like kaboose.com and have kids do one of these fun eco-friendly projects. Theyll be living green and loving it in no time. Just as an aquarium is a little body of water in your home, a terrarium is a little plot of fertile land. Your kids can make a terrarium for their favorite seeds just by saving an old soda bottle. Remove the label from a 2-liter soda bottle and cut it a few inches above the bottom. Fill the newly-created base with dirt or potting soil. Water the soil and add a few seeds. Fit the top of the bottle (which should still have the cap on it) over the newly-potted base. Place it in a sunny area of your house, and watch your favorite plant grow. This fun project not only teaches kids how to grow their own plants but also demonstrates they should find new uses for old items that would otherwise occupy a landfill. Many shirts, skirts, and dresses get worn out and ultimately thrown out. Sadly, so many beautiful buttons are tossed that you would need heavy equipment transport to hold them all—that is, unless you keep them and give them new life as jewelry. There was a time (long-forgotten now) that a button was a natural product from mother-of-pearl or some other organic material, and would never be thrown away. Today, they are for the most part plastic, and so, discarded. Reuse them! Heres how. Start by collecting the buttons; either take them off clothes youre about to throw out, or pick up strays that got lost along the way. Cut a piece of twine or string long enough to become a necklace or bracelet, then tie a knot at one end. Add the buttons to the string, and tie your new piece together with a double knot. Finally, snap a picture of the child modeling his or her new creation. Kids love creating new things, so theyll love this project for letting them be creative while also teaching them that some things shouldnt be thrown away. When you grow your own fruits and vegetables, you create a food supply thats fresh, healthy, and free of pesticides and other preservatives. Its also a great activity for kids and a good way to introduce them to healthy eating. Heres how. Find a small space to create a garden; an unused sandbox would work. Add your soil and till in the appropriate soil amendments for your area and the crops you are planning. Plant a seed thats easy to tend, or pick the plants from the terrarium in Step 1 and replant them. This is especially helpful if you are planting a spring garden; get a head start on the climate! Go through the whole gardening process with the child, and give her the tools shell need to maintain the garden on her own. Make sure to plant something shell enjoy, like flowers or her favorite fruit. Try planting a fruit tree or two. Maintaining a personal orchard will not only provide an organic harvest harvest every year, it is a great opportunity to teach your child about responsibility and seasonal maintenance. 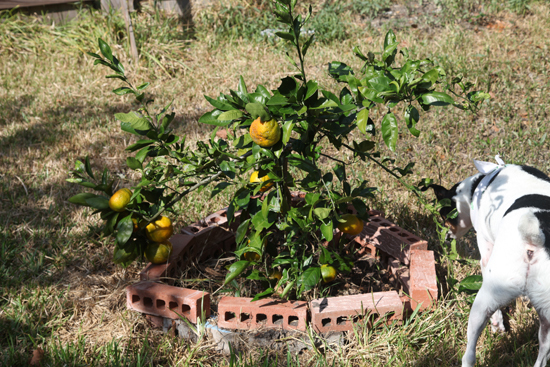 See the photo of the Satsuma Orange tree at the beginning of the article. Gardening is a great activity because it teaches kids a valuable skill while also providing a ready-made supply of healthy food or beautiful flowers. Want to teach eco-friendly habits to kids? Start with these fun projects and theyll be on the road to a more environmentally conscious life. 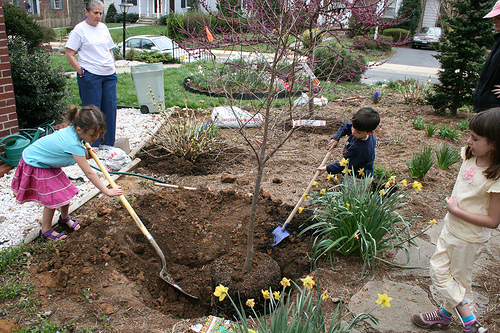 Have you discovered any fun eco-friendly projects that your kids loved? Share them with our readers in the comment section below!